FBH introduces novel diode lasers and advancements at Photonics West 2019. Applications of the flexible and compact light sources include LiDAR, medicine, and (Raman) spectroscopy. Results and progresses in UV LEDs are presented jointly with the FBH spin-off UVphotonics. The Ferdinand-Braun-Institut (FBH) presents novel developments and advancements of its diode lasers and UV light-emitting diodes (LEDs) at Photonics West 2019, San Francisco (USA) from February 5-7, 2019. At the German Pavilion, the institute showcases its full range of capabilities, from design through chips to modules and prototype systems. With 20 scientific contributions, FBH is also noticeably represented at the accompanying conferences (2-7 February). One focus of FBH’s R&D is on high-power diode lasers used, e.g., in materials processing both directly and as pump sources. Among others, FBH’s Director Günther Tränkle is giving an overview in his plenary presentation on recent design improvements that are boosting efficiency, peak power, brilliance, and range of emission spectra. 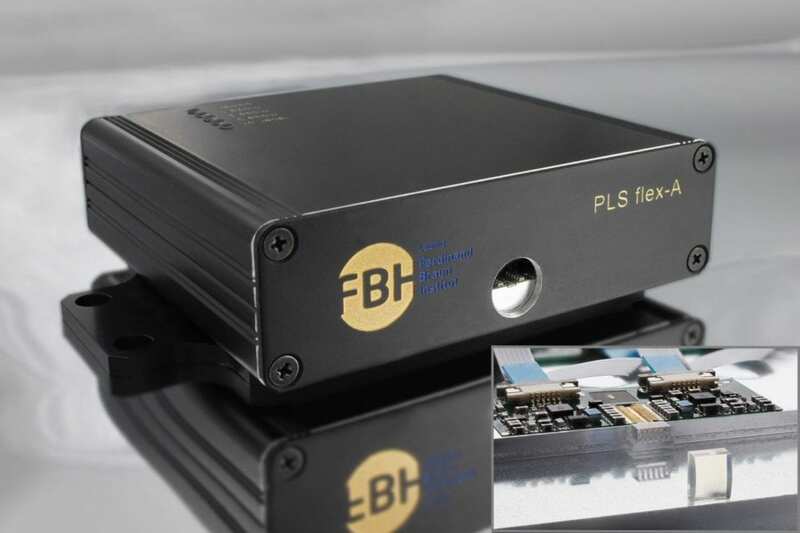 The FBH offers flexible laser sources delivering 200 ps to 20 ns pulses, allowing all systems to be flexibly assembled with diode lasers of further wavelengths and power ranges. For automotive LiDAR systems, for example, wavelength-stabilized laser diodes have been developed emitting 5 ns pulses with 40 W pulse power near 905 nm with good beam quality and up to 85°C. 3-emitter laser chips, whose emission can easily be optically combined into one single spot, yield up to 100 W. Chips can be delivered with FBH driver or as stand-alone PC-controlled laser source. Another versatile and particularly sophisticated system is the efficient all-in-one pulse laser system PLS. It combines in-house developed optical and electronic semiconductor components, delivering ultra-short light pulses from 5-15 ps. It provides any desired repetition rate from the hertz to the MHz range; pulse peak performance reaches > 20 W output power. The FBH has developed compact laser modules emitting watt-level power in the yellow spectral range, wavelengths from 532 nm to 590 nm. Based on a single package sized only 76 x 54 x 15 mm³, each solution is designed to ideally serve the specific application. They are available in both CW and pulsed operation for photo-coagulation treatments in ophthalmology or use in fluorescence spectroscopy and STED microscopy, respectively. The modules introduced here feature an all-semiconductor master-oscillator power-amplifier (MOPA) combined with frequency doubled (PPLN) crystals and provide polarization-maintaining fiber output options. Due to these new laser modules, the size of laser systems for medical applications will significantly shrink, from rack size to the dimensions of a shoe box. For rapid SERDS measurements, FBH has demonstrated monolithic dual-wavelength diode lasers emitting light alternatingly on two slightly different wavelengths around 785 nm and also around 671 nm. These Y-branch DBR diode lasers with electrically controlled micro-heaters implemented above the gratings provide dual-wavelength laser emission and wavelength tuning over several nanometers – simply by changing the heater current. The sources enable fast alternating operation between both laser emission lines, thus investigations with reduced exposure times down to the millisecond range. Supplemented with battery power supply, electronic measurement equipment and a software interface, the systems can be used for in situ measurements. In-house developed, portable systems have already been successfully utilized for measurements on food, soil, plants, and human skin. Visit us at Photonics West 2019, German Pavilion, booth 4545-49 (FBH) and 4545-50 (UVphotonics). Find an overview of the 20 FBH contributions to the accompanying conferences here: https://www.fbh-berlin.com/news-dates/dates/detail/fbh-at-photonics-west-2019.